Rabbits are the most abused domestic pet in England and Wales, with 35,000 abandoned every year, says the RSPCA. The animal charity said a survey found that 70% of rescued rabbits had been kept hutched 24 hours a day. Almost 40% had had no food, and half had been living in filthy conditions, it told the BBC. It found that people bought rabbits but then quickly lost interest. On average the abandoned pets it came across had been dumped after just three months. Many were simply released in the street or into the wild. Rabbits are the third most popular pet after cats and dogs and the RSPCA says that rescue centres are struggling to cope with the 35,000 unwanted pets abandoned every year. If you didn't have the children, would you be keen to have the rabbit? Anne Mitchell from the Rabbit Welfare Association warned that parents needed to realise the responsibilities that go with caring for rabbits. The animals can live for up to eight years and cost £4,000 over their lifetime. "If you didn't have the children, would you be keen to have the rabbit? If you wouldn't, don't do it," she said. "Ninety percent of children get bored, they're tired very quickly of the chores. "You can't treat it like Barbie doll and Action Man and just stuff it in the cupboard under the stairs, although sadly some of these rabbits do end up like that, totally neglected." The RSPCA statistics will be released next week as part of a survey into rabbit welfare. I think the estimate of £4k to keep a rabbit is a little on the high side. Like with any pet, you should always make sure you have a contingency fund for treating any unforeseen illness, but pellets, hay, treats and veg for my house bunny cost no more than £20 per month. It's a shame to think of people deciding against rescuing a rabbit because of the expense. I'm sure most spend twice that on their mobile phone bills! My family has had three rabbits over the years, and the latest one is a rescue. She was obviously abused, because even after 6 years, she still bites and growls and lunges at us on occasion and is very difficult to pick up for a cuddle. However, she can also be incredibly sweet, and once she is picked up, nuzzles and snuggles like any of our other rabbits did. She is inquisitive and incredibly bright for a rabbit, and has often been known to play games with us. Yet she was abused, or at least neglected (which is of course just a form of abuse). Taking care of rabbits isn't that difficult. It requires dedication and work, just as owning any other animal does. People need to be sure they have 8-15 years to dedicate to caring for a rabbit before they buy one - they are much longer lived than most realize. I discovered not only a Guinea pig and a Lop eared Rabbit what must have been hours after being dumped in the middle of a heavily forested suburb. The hutch and feeding and drinking bowls were there including a pile of sawdust, the Guinea pig I caught and knew of someone who would care for it alongside other pets their very responsible children had. The rabbit was afraid and ran off into the woods only to be discovered dead where it had been left, it had obviously gone back to its pal and the home it had known, it is so wrong to think by releasing domestic pets into a wild environment would be a kind thing to do, they would be lucky to last the first night. Duncan Quick, York, North Yorkshire. Many problems these days seem to be children thinking a rabbit is cute and fluffy and small, but they grow and require lots of attention, time and money (much like the children do!) which kids these days cannot deal with. Whilst rabbits are small and cute, they aren't cheap. Home visits should be carried out to ensure rabbits are kept in a suitable environment, much like with cats and dogs. My sisters have not found caring for their rabbits to be a burden because of the joy that they bring, and it disgusts me to think that so many parents have such a flippant attitude towards their actions. Rabbits are great pets , IF you are prepared to care for them. I have 2 rescue rabbits and everyone acknowledges they are mine and not the children's. The care involved is huge, as much as owning a large dog. they need daily hygiene, a minimum of 2 hours of exercise, play and entertainment, some need daily grooming and all rabbits need a varied diet including mixed fresh vegetables. I have advised many friends that have asked about rabbit ownership to consider the amount of care involved before making any purchases, and I try to ensure they understand how many bunnies need rehoming before they look at the cute bundles of fluff in a pet shop. I have two rabbits and they are perfectly healthy. You just have to see that they are living breathing animals that need your love and care. You can't just say "I'm not going to clean their hutch or let them out because I don't feel like it." Can someone explain what gives a human being the right to turn wild animals into pets? And what exactly does keeping a pet teach a child? How about observing animals free and in their natural habitat instead? Of course patient observing of nature requires more effort, more involvement, and more knowledge, from the parents. It teaches a child (and her parents!) how to observe, it encourages her to be inquisitive and to try to interpret and question what she observes. It also teaches respect for animals and nature, and readily leads to other worthwhile activities or hobbies. Much healthier for everyone than keeping a pet in a cage I think. Any thought anyone? I rescued my pet rabbit, She'd had been locked in a cage 24/7.. She now has a happy life here with us, she lives in the house with us & makes a great little pet.. How can people be so cruel? If you have a rabbit make sure the hutch is big enough & please please make sure they have a decent size run.. I cant understand some people. How hard is it to look after a rabbit? we decided to get my son a rabbit and we got a northumberland dwarf as they don't grow very big, a little tip for people with a medium sized cage, also we got a male as they are they are the less aggressive type, and he's gorgeous. we keep him in a hutch and he is fed twice a day, twice a week he has a treat of fresh veg, when weather is not too bad we just let him run about for an hour and he loves and springs about, we recently had his nails clipped and the vet said he was very healthy, he now comes to you when you feed him and nuzzles your hand, and do you know what I find it ten times easier looking after our rabbit than keeping up with all the housework, so come on people, no excuses!!!!!!!! We took a rabbit from one of the national pet shop chains as he looked in poor condition and cowering in a corner. Our rabbit is still very timid, over 2 years on and he has had some severe health problems which means he cannot live outside, he lives in our house now and has the free run of the house, in essence, he's a house bunny. If you are going to get a rabbit, ensure that you can look after them, they need food, water, fruit and veg every day, plus hay. They need grooming, neutering and plenty of exercise and attention. We adore our rabbit and he gives us so much pleasure but they do require a lot of love, care and attention. Rabbits give so much back but if you can't afford to give them the time they deserve, please don't buy one and please don't buy one as a Christmas present. I have 3 rabbits. To give them up or to abandon them is just not a option. It is hard work looking after the hutches in winter but i still get out there when its cold and clean them and feed them. In the summer i trim there nails and let them out for runs. They are the nicest creatures ever. A message for all readers, "Don't abandon them always ring the RSPCA and get them taken away with dignity". Animal Cruelty still shocks me every time I hear it. I myself have 2 rabbits, 2 guinea pigs & 2 hamsters and I love them all so much. I was surprised of how much hard work looking after a rabbit it. There about the same hard work as a dog. all animals need excersise and a good diet and love and attention of course. but rabbits have a very sensitive stomach, need at least 2 hours of love & and affection a day and of course need to be let out of there cage for a few hours at least! The punishment for animal cruelty should be firmer. not just a slap on the hand! Yes, I've rescued a rabbit and i'm waiting to rescue my next one. It's terrible to read what's happening as rabbits make fantastic pets. All you need is a bit of space and then watch them run, jump and play. They are so funny to watch but sticking them in a teeny weeny hutch doesn't let children (and adults) see their full potential. They're more playful than adult cats for example. If you want a rabbit get the biggest hutch you can and a large run and get in there with them - you're kids will be soon like my 3 year old son - can't get enough! We found a rabbit in the gutter five years ago. Nobody claimed her so we kept her but she has cost a considerable amount of money in vet bills over that time. As much as we like her, a rabbit would not be first on our list of pets. To throw a rabbit into a hutch and think that that's all the life it needs is just wrong and cruel, they need a lot more mental stimulation than that. As for them being a good children's pet, that's a myth, children will grow bored of them quickly, and rabbits are more fragile than people believe, serious back injury not being uncommon if they fall or jump the wrong way. They should not be a disposable commodity in this disposable society. We've had rabbits in my family for years and we always get them for RSPCA rescue centres. It's beyond me why anyone would pay for one at a pet shop when there are so many who needs homes and might be put down if they don't find one. To buy a pet without realising what's involved and that you might get bored of it is sheer idiocy. Get a rabbit because you have compassion towards animals and rabbits and want it to be part of your family. Don't get it if you really can't be bothered to pay for it, clean its hutch or let it run around for a few hours a day. It just causes suffering. As a vet with a large primary and referral caseload in rabbits I see this every day. People get bored of the rabbits very quickly, and haven't researched the costs and keeping of their animals at all. It's sickening to think I only see the ones who are honourable enough to bring their animal to us and admit their failure. If a rabbit is healthy we do what we can to rehome it but it's a losing battle. I regularly see rabbits living to 10 years old, some to 12, and those are the lucky ones. The second commonest cruelty cases I consult for the RSPCA are abandoned rabbits, and we investigate those thoroughly - those we catch are prosecuted. It is heartbreaking to see animals just dumped in the middle of a park with no food or water simply because ignorant people got tired of taking care of them. With housing facilities at breaking point we have to be ruthless about those we keep, and those we have to euthanase. It's disgraceful we're put in that position by those who take on what they cannot care for. The estimate of costs for keeping a rabbit in the article is about right. The other problem is people not feeding their rabbits properly. Hay. Grass. Hay. Grass. That's it. Perhaps a supplement if you want to. "Mixes" and so on will just end up in dental disease, and a lifetime of pain and discomfort, and a huge vets' bill. I was given a rabbit about 6 years ago as a gift. To be honest in the first week I wasn't sure if I wanted him as I knew nothing about rabbits and I was bit nervous if he would bite me and from the way he would sprint around the room so fast I just got put off and at night would put him back in the hutch. Six years later I still have him and would never give him away as he is so intelligent, fun and affectionate and crafty I sometimes forget his a rabbit from the way he behaves. He is litter trained and when he knows I have been into the kitchen he comes sprinting towards me as he knows his getting a treat. The bottom line is although rabbits are not like other animals and don't really make noise they are very sociable animals and the more time you spend with them the end results are amazing. Just because they are quiet and not like a puppy or kitten that doesn't mean people should abuse them in anyway as they are also very delicate animals. I love my bunny so much I let him I sleep in a massive indoor cage that I purchased that has ramps and toys for him. Rabbits get very stressed easily and it is not right to keep them locked in their hutch for too long. I strongly feel that people should not be allowed to purchase rabbits or any animal for that fact if they are going to think of it as a short term interest. Rabbits are hard work as i know how many times I clean his cage and feed him because its not humane to let them stay in a dirty cage. Jay jay has been a really nice experience for me that six years ago I would have laughed but if you give it a chance and spend time with your rabbit the rewards you get back are priceless. I have 8 Rabbits, 4 of which are rescues. One was found running around our road and nobody ever claimed him. I have had him for 4 years now. Even though I handle him every day and he has been castrated he is still aggressive and I doubt he will ever get over anything that happened to him before he came to me. 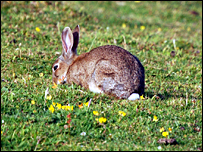 Another was used to breed baby rabbits to be used as food for snakes. She was pregnant when she came to me. She killed all the babies. Think of the animal and not your children. They don't need a rabbit. It won't teach them responsibility. Maybe if people stopped buying them the demand wouldn't be there and people wouldn't be irresponsibly breeding them. Break that circle. I got my two rabbits from Greenwich rabbit rescue. Both were 3 month old minilops, from different homes. After some unsettled and anxious behaviour like peeing on my lap, running away from pointing fingers or nipping and keeping jaws open, they are now almost docile. They pretty much have the run of the house, and when it's not too cold, run around the garden for a few hours. There is daily hutch cleaning and feeding, but otherwise, they are happy to lounge and hop about. I have no kids, so maybe that helps. I have taken in 2 rabbits over the years which were unwanted pets. I have also taken in budgies, hamsters, and a dog which were all unwanted. It really annoys me that people don't think long term about pets and are quick to dismiss them. Bring back licences - as anyone prepared to buy a licence will be prepared to look after a pet long term. It is something that should be taught in school - the cost and effort that goes into owning a pet (babies as well). I only support animal charities, and being so soft over animals, people will always come to me first with any unwanted pets - and i can't say no. My local paper often advertises pieces on animal care - could this be done nationally? I found our rabbit in our garden on 4 Jan 04. I had seen her around the neighbourhood, under parked cars and running through the bushes. I caught her and brought her into our home. This is where she stayed for nearly 2 years, as my house rabbit. She was very easy to train, she had a hutch in the utility room which was always open, there was a litter tray next to the hutch. The back door to the garden was always open so she could hop in and out when she felt like it and when the weather was fine, she even used to hop back in to use the litter tray. I have three children from 18 down to 12 and they adored her but she was my rabbit when it came to feeding, cleaning and clipping nails. They just gave her a name; Fubu. I had to have her put down Last Christmas as she had arthritis in her back legs due to the bad diet and care she used to suffer from. This was heartbreaking to watch in such a friendly animal but this is what happens when people don't care enough about their pets.! I "adopted" a rabbit nobody else wanted when I was a child. I'm now 51. I still remember him along with the cats and dogs I've had since then. I remember the love I felt for him, the unconsolable sadness I felt when he died. The feelings generated by loving and caring for my pets and the responsibility involved are things that I've tried to pass on to my children. I'm absolutely sure this has made us better people. I now have three abandoned cats and an abandoned dog. Abandoning pets says something about who we are and the society we've all "helped" to create. None of us should ignore this fact. Rabbits are social animals and so need company. If you are going to keep a Rabbit outdoors in a hutch they should be kept in neutered/spayed pairs for company. The best combination is a male and a female. If kept on their own Rabbits can become very depressed. A hutch should be large enough for the rabbits to stand up on their back legs and have a permanently attached run for exercise. If you are going to keep rabbits with enough attention to their welfare then please bear in mind that they are not cheap pets. The initial set up costs for a pair of rabbits with a suitable hutch, vaccinations, neutering/spaying and food is around £600. If you aren't prepared to spend this sort of money then you really shouldn't buy them because to not provide all they need is cruel. Having said all that rabbits make excellent pets, we have two which actually live in the house and give us many hours of pleasure. In case you are wondering they are very clean and are easily litter trained! I recently took on a rabbit that someone no longer wanted. He was kept in a tiny hutch 24 hours a day and rarely had any water or adequate food. He now has a 7ft enclosure and run of the garden when we are home. I have bonded him with my female and they are totally happy. Rabbits are NOT kids pets. They can be feisty, hard to hold when fully grown and territorial when not neutered. Only get a rabbit if an adult will ultimately be responsible for it. Kids cannot be expected to take sole responsibility for one. Rabbits should not be kept alone, or with a Guinea Pig. They should be neutered, vaccinated, have time spent with them, get regular daily exercise, a good diet including a supply of hay constantly, the list is endless. Please, please, do not buy a rabbit on a whim without giving it a lot of thought. Please also do not buy from a pet shop when there are so many animals in rescue. In 1997 we found a french lop rabbit that had been dumped and she was most probably was an unwanted easter bunny that was bought for a kid who grew bored of her. Many parents sadly give in to temptation and buy rabbits as pets for their kids on the spare of the moment no thought in their future care etc, not meaning to be cruel but the children just lose interest after a while and therefore the poor bunny suffers, locked up in its cage or even has no food or water. Many cages are way to small that they sell in pet shops and the poor bunnies who once fitted in them as babies and then soon row soon outgrow their enclosures and therefore have no room to move. Thumper was lucky we rescued her and lived a very long and happy life estimated to be between 9-13 years old, many parents need to be aware of the costs rabbits can occur in their lifetime which can be 7years or more! and also they need to be aware that they need vaccinating against deadly diseases such as vhd and myximotosis. last week i saved two lionhead rabbits 1 girl and 1 boy they were about 3 month old, which were housed in a small bird cage, they were living in filthy conditions they had no food or clean water. Thy female rabbit was really skinny and had large amounts of matted fur around her rear end, it took 45 mins to cut it away. they are now both happy and healthy rabbits. i already have 4 rabbits of my own, and they are in healthy condition, they are let out of their hutches everyday from 7.00am-8.30-9.00pm (into a 16foot log cabin, with mesh windows) and are cleaned twice a week, they are also provided with fresh greens everyday, i also have live with two lovely rottweiller who play and clean the rabbits. i think that if people are thinking of owing rabbits they should do some research before hand, because its not as easy as it looks.